Yellow fever is an acute viral disease caused by the yellow fever virus and is transmitted by the bite of an infected female mosquito. The virus is an RNA virus of the genus Flavivirus. Symptoms of yellow fever include fever, headache, jaundice, muscle pain, nausea, vomiting and fatigue which improve within five days but in some cases, liver damage begins causing yellow skin. Blood tests (RT-PCR) can sometimes detect the virus in the early stages of the disease. In later stages of the disease, testing to identify antibodies is needed (ELISA and PRNT). To confirm a suspected case, blood sample testing with polymerase chain reaction is required. There is currently no specific anti-viral drug for yellow fever but Good and early supportive treatment in hospitals improves survival rates. A symptomatic treatment includes rehydration and pain relief with drugs such as paracetamol. Prevention of yellow fever includes vaccination, as well as avoidance of mosquito bites in areas where yellow fever is endemic. 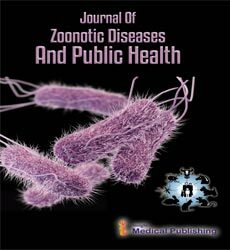 Journal of Community Medicine & Health Education, Hospital & Medical Management, CDC and Zoonotic Disease, Pathogenic Landscape of Transboundary Zoonotic Diseases, Zoonoses.